Spray on a wet body after car wash, then wipe it off (can also be used for dry body). Make your car shine and gloss like after wax usage with a simple spray and wipe. A hybrid structure with two types of special glass components and a high brightness polymer make the brightness and deep gloss of the smart mist series No.1. Available for all body colors. Especially recommended for dark vehicles such as black or red. 1.Wash the car to remove dirt and sand. 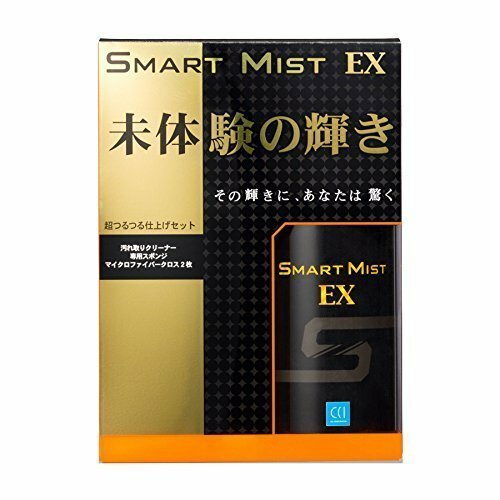 ※ With Dirt Remover, we will pull out the performance of "Smart Mist EX" to the maximum. 4.When the body surface dries white, wipe it up with the supplied wiping cloth (small). 5. Shake the bottle well and turn the nozzle tip to the "ON" position. 6. Spray on the wet car body. 7. Wipe the car body up with a wiping cloth provided.